Klaus Meisner has an unusual business plan. His company supplies delicate designer flowers, the rare radioactive energy source MRD, and possibly time travel. Presumably, the mark-up on the first two is extremely profitable. The latter is under-development. Unfortunately, the socially awkward scientist who devised the wormhole opening technology is getting a little erratic. That sort of happens when your future self comes back in time. 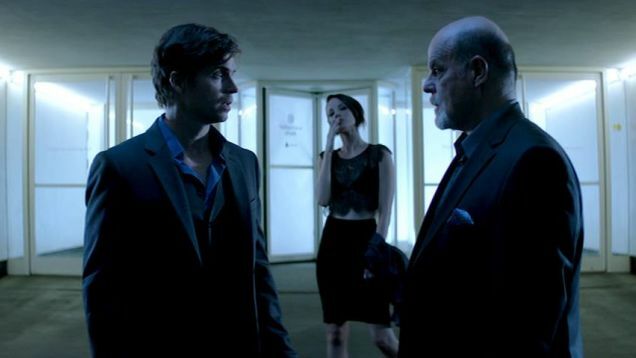 Complications arise in Jacob Gentry’s Synchronicity (trailer here), which opens this Friday in Los Angeles. Meisner has a stranglehold on the world’s MRD supply, but it is the only thing powerful enough to drive Jim Beale’s Frankenstein-looking apparatus—thus, his overtures to the stone cold venture capitalist. Initially, his command test drive looks like a disaster, but when the smoke clears, Beale discovers the duly transmitted sample dahlia—or something. Don’t get hung up on any technical details. Gentry knows they make no sense so he blasts them by the audience at warp speed. Just accept some serious time traveling is about to happen—unless its actually a wormhole to a parallel dimension. Just don’t get hung up period. The important thing is Beale figures out Meisner and his femme fatale kept woman Abby have been playing him—unless Meisner has been playing them both. Maybe she seduced him or maybe they just fell for each other. Beale will try to determine which is true and also save his breakthrough technology from Meisner’s grubby clutches by jumping through the wormhole. Of course, he can’t meet himself in the same time period, so his Mutt & Jeff assistants, Chuck and Matt, will contrive ways to keep them apart. That will get increasingly difficult. The world of Synchronicity is rather pleasantly neo-retro-futuristic, looking like half Bladerunner and half New York Marriott Marquis, which is pretty cool. There are a lot of concrete stairs for Beale and Beale Prime to scamper up and down. This is a wonderfully choreographed time travel film, much like Timecrimes and The Infinite Man, but it lacks a similarly airtight internal system of logic. Rational causality goes out the window pretty early, but Gentry replaces that pedantic hobgoblin with a healthy dose of hardboiled noir. He even throw in a dash of the unreliable narrator down the stretch. Chad McKnight is solid enough as the theory-smart, life-dumb Beale and Briane Davis generates plenty of sparks as Abby. However, the real genre glee comes from Michael Ironside doing his villainous thing as Meisner and A.J. Bowen’s Chuck, serving as the slightly smart-alecky audience surrogate and increasingly exasperated voice of reason. Good things happen when those two are on the screen. There are some nicely rendered effects in Synchronicity, but it is the look, vibe, and locations that you will remember. Gentry keeps the chaos churning and the pace at a breakneck gallop. Frankly, the way he throws caution to the wind and keeps going all-in will wear down the objections of any regular genre film patron. 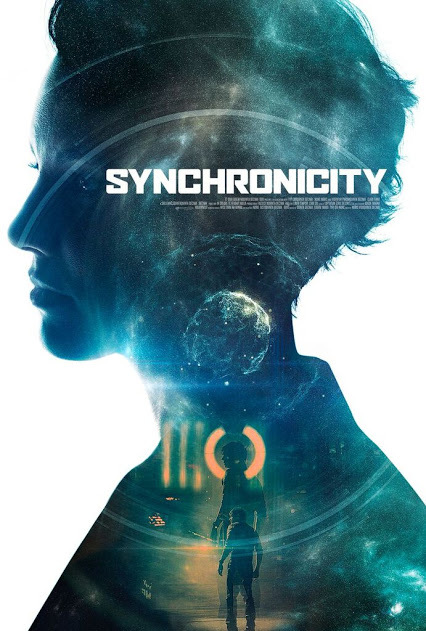 Recommended for time travel and noir fans, Synchronicity opens this Friday (1/22) in LA at the Sundance Sunset Cinemas, and also releases on VOD platforms.